Bathtub Replacement - Is there a good alternative? Bathtub replacement may be necessary when your bathtub is worn out, damaged, hard to clean, or simply the wrong color. However, tub replacement should be done only as a last resort. 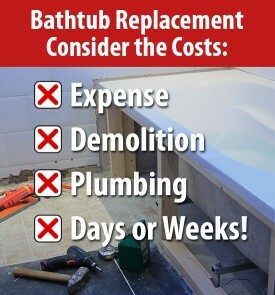 Bathtub resurfacing is a cost effective replacement alternative that can restore your existing tub to a like-new condition in any color you choose. Miracle Method comes to you and can refinish your bathtub without removing it, saving you time and money. Miracle Method can restore the useful life of your bathroom fixtures for up to 15 years or more. Our finishes are incredibly durable and come in an unlimited number of colors to meet any decorating plan. Bathtub replacement starts with a new bathtub, which will typically cost between $200 and $500. However, the total cost to install can be $3,000 or more! Replacing your bathtub is a job for a professional! It can be both expensive and difficult! Remember new tubs differ in width from older tubs. How to find a professional bathtub refinisher? Replacing your bathtub should be considered as a last resort. There are many bathtub refinishing companies, but to get good advice on bathtub replacement versus professional tub refinishing, you will need to ask specific, probing questions. With nearly 30 years of experience, your local Miracle Method office is a good place to start. Click on Find a Location or call our toll free locator number, 1-888-271-7690, to reach the nearest Miracle Method professional.